A down-to-earth, modern hotel with one of the best locations in the city, the NH Barcelona Centro is a highly recommended as a place to base yourself for exploring the art, culture and history of the city as well as enjoying the many nearby shops, cafés and restaurants. 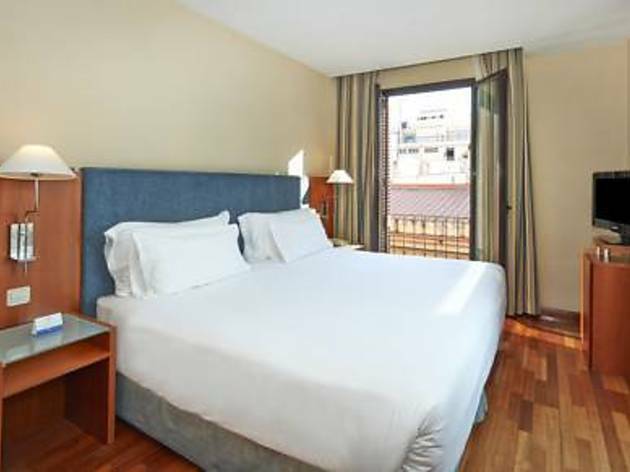 This three-star hotel is part of the extensive NH group and has much to commend it as a place to stay in Barcelona, not least its excellent location in the Barri Gòtic, which offers both history and a wide range of shops right on your doorstep. It’s a no-frills place where you won’t find a huge list of extra services, but, frankly, with such a great location, you’re likely to be mainly using the hotel for dropping off your shopping bags and giving your feet a rest before heading off to discover another great restaurant or unmissable landmark in the vicinity. The rooms are well-sized and practical; some offer views over the surrounding area, while junior suites and superior rooms have space for three people. The breakfast buffet is expansive (and served until noon on Sundays) with hot and cold, healthy and more indulgent options to set you up for your day out and about, and the Open Bar in the lobby serves drinks and snacks 24/7, 365 days of the year. 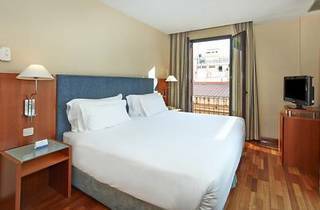 Location: Thanks to its location in the Gothic area of the city, a stay at the Barcelona Centro means you’re surrounded by history as well as numerous things to see and do, bars and restaurants, and places you at the heart of one of the main shopping districts and close to different public transport options. Via Sepulcral Romana: Just a minute from the hotel is an important site from the Roman city of Barcino that used to stand here: it's a section of a secondary road that was also used as a burial place between the first and third centuries AD. A walkway runs over the funeral monuments that have been uncovered to give you a great view of the finds. Museu Frederic Marès: Senyor Marès (1893-1991) was a sculptor and art professor as well as an avid collector throughout his life, and thousands of the objects he bought with his hard-earned cash are displayed in this one-time palace next to Barcelona Cathedral. In the summer, the building's patio hosts a popular al fresco café. Mannà Gelats: Thanks to Barcelona’s generally mild winter weather, warm spring and autumn, and extremely hot summer, pretty much any day of the year can be a day for ice cream here and if you’re in the mood we suggest checking this place out. Specialising in flavours made with tropical fruits, including some exotic types you might not be familiar with, other recommendations include the peanut butter and pistachio varieties… You’re welcome. Restaurant El Cercle: Found within the historical building of the Real Círculo Artístico, this gastro space has three different areas including The Library, where you can sample innovative takes on popular Catalan dishes, and a bar where you can sit watching chef Taka make your Japanese food from scratch. Good for: Anybody who wants to combine culture with shopping while visiting the city; a wide range of both are just a few steps away from the hotel, which serves as an affordable base for really getting the most out of Barcelona. Weekend breakers who will love the free 3pm check-out on Sundays. Amenities: Laundry, Bar, Free late Sunday check-out, Free WiFi, Minibar. Time Out tip: Take a break from your spending with a visit to one of the most hidden jewels in this area of the city, Santa Anna church. Tucked between the shop-lined streets of Portal de l’Àngel and La Rambla, this Gothic building dates from the 15th century and includes a beautiful cloister that will make you forget you’re in the middle of a cosmopolitan city. If you’re looking for a special evening out close to the hotel, the church also hosts Spanish guitar and classical music concerts.